What are the basic principles underlying European Community Law? Although no one seeks a purely descriptive answer to this question, the discussion it gives rise to is of immense significance both for theoretical legal studies and for legal practice. Over the years, scholars have convened from time to time to re-examine the question in the light of new developments. This important volume offers insights and findings of the latest such conference, held at Stockholm in March 2007, and sponsored by the Swedish Network for European Legal Studies. The nineteen essays here printed are all final author-edited versions of papers first presented at that conference. • the instrumental function of the EC Court. There is also special consideration attached to such overriding issues as the gap-filling function of the principles within the Community legal system, and the implications of the use of a comparative methodology. The authors include both eminent, well-known experts, many of whom took part in the 1999 Conference, and representatives of a new generation of younger scholars in the field. 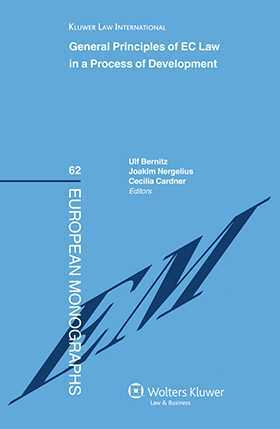 For the myriad parties involved in the evolution of the European project from a legal perspective, this book serves as a watershed, a thorough inspection of the foundations as they are perceived and understood at the present moment. It is sure to be consulted and cited often in the years to come. 1: Constitutional Law. 1.1. Is Direct Effect a General Principle of European Law? J. Bengoetxea. 1.2. Two Twin-Principles of EU Law: Democracy and Accountability, Consistency and Convergence; W. van Gerven. 1.3. The Principle of Legal Certainty as a General Principle of EU Law; J. Raitio. 1.4. Article 10 EC: The Most Important ‘General Principle’ of Community Law; J. T. Lang. 1.5. The Judicial Deficit in the EC: Knocking on Heaven’s Door? O. Zetterquist. 2: Private Law. 2.1. Structural Measures in EC Competition Law: A Bridge Too Far? L. Henriksson. 2.2. Are There General Principles of Community Law Affecting Private Law? X. Groussot, H.H. Lidgard. 2.3. Contribution of General Principles to EC Financial Market Integration; S. M. Seyad. 2.4. Summary: Are There Any General Principles in Private Law? D. Eklöf, L. Pehrson. 3: Administrative Law. 3.1. Transparency: A General Principle of EU Law? S. Prechal, M.E. de Leeuw. 3.2. Between Supremacy and Autonomy: Applying the Principle of Good Administration in the Member States; J. Reichel. 3.3. Summary of the Discussion; J. Reichel, M.E. de Leeuw. 4: Future Developments. 4.1. Constitutional Rights versus Supremacy of EC Law in the New Member States: Ironies in the Light of the Pre-Accession Conditionality; A. Albi. 4.2. Some Further Reflections on the Development of General Principles of Law within Article 10 EC; L.W. Gormley. 4.3. ‘Principled Citizenship’ and the Process of European Constitutionalization: From a Pie in the Sky to a Sky with Diamonds; X. Groussot. 4.4. General Principles of EU Law: The Methodological Challenge; M. Herdegen. 4.5. Application of General Principles of EC Law by Polish Courts: Is the European Court of Justice Receiving a Positive Feedback? D. Miasik. 4.6. General Principles and National Law: A Continuing Two-Way Process; J.A. Usher. 5: Summary of the Conference. 5.1. General Principles: Some Reflections on their Development in the 21st Century; J. Nergelius.